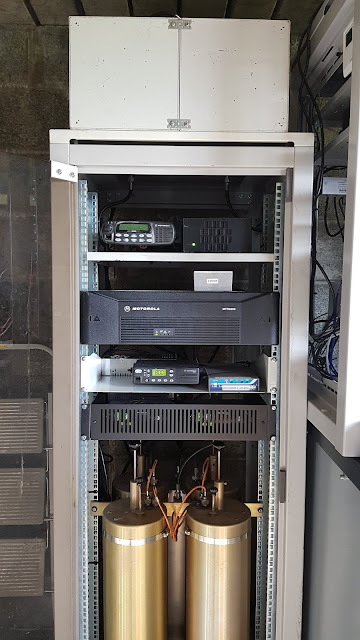 Our APRS digipeater EI2FHP-2 which covers the West Waterford and East Cork areas has been relocated from the QTH of Francis EI5GOB to the nearby site of the 2m voice repeater EI2HHR at Helvick Head. This has been made possible following recent experiments by Neil EI3JE involving the modification of bandpass cavities to BpBr filters allowing both the repeater and APRS digi operate from the same site without interfering with each other . The APRS digi is now using a folded dipole antenna at 70 feet on the tower which is our standby antenna for the repeater. The relocation work was carried out today by Neil EI3JE and John EI8JA. The group wishes to thank Francis EI5GOB for hosting the APRS digi at his QTH since it was put on air in 2005.